Hey there, do you have time to answer a quick question? We tried to ask a doctor and an anesthesiologist what exactly makes a great stethoscope, and let’s just say our conversation was mind numbing… Then, we tried to give the brain surgeon a piece of our minds on the subject, but when he came at us with a scalpel, we bolted! So, what do you think makes a great stethoscope? You may want to pick one of these up to see! 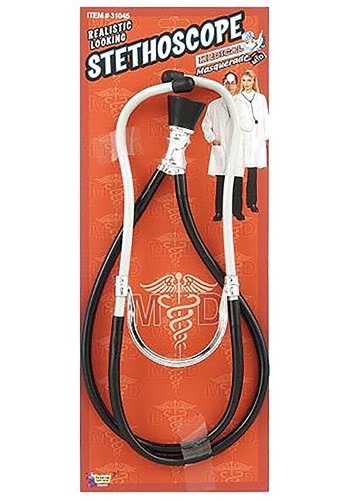 Give your doctor or nurse uniform the boost-er shot it needs with this Medical Stethoscope. You can’t think that people will take you seriously if you don’t have the proper medical tools. You can also use this Medical Stethoscope prop for playtime, when your little one wants to give you a check up! No child wants to play doctor without the right tools, that’s just a sick joke!